Filiz Aygündüz was born in Istanbul in 1971. She graduated in mathematics from the Mimar Sinan University’s department of Arts and Scienes. She has worked as a mathematics teacher at various highschools, and as a freelance journatlist for various magazines such as Topaz, Go and Cosmopolitan. In 1995, she began writing for Duygu Asena’s women’s magazine Kim and the culture and arts magazine Negatif. In 1999, she resigned from the teaching profession for good. After Kim ceased to be published in that same year, she started to write freelance for the culture and arts section of Milliyet newspaper and for the magazine Milliyet Sanat (art magazine). 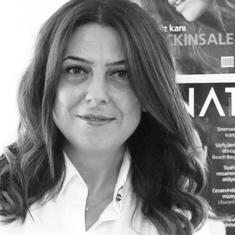 In 2007, she became the director of the culture and arts section of Milliyet, and the editor-in-chief of Milliyet Art in 2008.Her first novel called “Kaç Zil Kaldı Örtmenim?” was published in 2010. The latest novel called “Prince Didn’t Like Princess” was published in 2015. While still maintaining both those positions, she has also become the editor-in-chief of the newspapers monthly book supplement, Milliyet Kitap.